Lin Ching-Tai gets ready for some decapitation in Warriors of the Rainbow: Seediq Bale. The Skinny: The four-and-a-half-hour version of Wei Te-Sheng's epic is as big as Taiwanese cinema gets, which automatically makes it worth seeing. Despite some powerful moments, it's also too long and too ambitious for its own good. Kevin Ma: Wei Te-Sheng will never be criticized for lacking ambition - after all, Wei made Seediq Bale, the four-hour epic that's officially the most expensive film ever produced in Taiwan. Wei makes sure that every dollar he spent (raised from private investors, government subsidies, his prize money from Cape No. 7 and even loans from stars like Jay Chou) can be seen on screen, with villages built from scratch and explosive battle scenes shot at remote locations. Wei is more likely to be criticized for being too ambitious, turning what might have been an excellent three-hour single film into a bloated two-film, four-and-a-half-hour experience that will exhaust those who choose to take it all in one sitting. It's true that Seediq Bale is a monumental film that deserves to be seen by anyone who cares about Asian cinema, but it's also so somber and assured of its own importance that it's difficult to call it enjoyable. While the story is based on the Wushe Incident of 1930, Wei begins his story in 1895 with the arrival of the Japanese military, who intend to exploit the natural resources in the mountainous regions of Taiwan. The Japanese are initially met with fierce resistance by the aborigine population, led by young Seediq warrior Mouna Rudo (Da Ching) of the Mahebu Clan. The opening 40 minutes of part one covers not only the beginning of the antagonistic relationship between the Seediq people and the Japanese colonizers, but also the rivalry between the Mahebus and other Seediq clans living in the vicinity. Even though the conflicts established in this opening section strengthen the emotional impact in part two's climax, it could have been shortened drastically. Considering that most of the story actually takes place in 1930, long after the Japanese takeover and the assimilation of the Seediq people, the first 40 minutes feel like an unnecessarily long digression. Seediq Bale finally begins to build momentum when it brings the story to 1930, as new characters like Hanaoka Ichiro and Jiro (Bokeh Kosang and Soda Yoyu), two Seediqs who work as policemen under the Japanese occupation, are introduced. Though mistreated by both the Seediqs (who think they’re traitors) and the Japanese (who still see them as savages), the two continue living the Japanese way of life and even take up Japanese names with their respective spouses (Vivian Hsu and Lo Mei-Ling, in small roles). 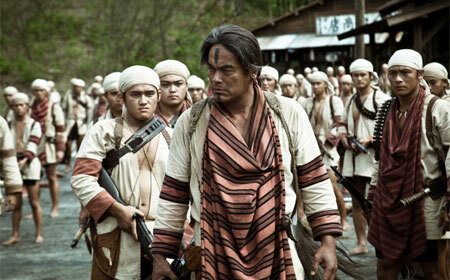 However, the main character is still Mouna Rudo, now an old man (played by Lin Ching-Tai) and the leader of his tribe. Though respected, Mouna is no longer the fierce warrior he once was. Instead, he has accepted Japanese rule (to the point of actually having visited Japan) and spends his days trying to maintain a precarious balance between the brutal Japanese rulers and his dissatisfied people. With very few soldiers like Kojima (Ando Masanobu), who actually treat the Seediqs with respect, this uneasy peace is bound to be broken sooner or later. The incident that breaks the peace finally happens around the 80-minute mark, when a misunderstanding between a Japanese soldier and Mouna's son at a wedding causes the two to clash. After getting off to a shaky start, the incident finally gives the film its needed focus. The characters are now united with a singular purpose, and the story finally finds its direction. Dramatically, the final hour of part one, which includes a powerful, shocking ending involving the indiscriminate killing of women and children, is by far the best section of Seediq Bale and offers a great setup for an explosive climax in part two. If you’re watching Seediq Bale for violence and explosions, then part two is why you're here. Continuing right after the violent massacre that caps off part one, the second part of Seediq Bale depicts the Japanese military’s retaliation and their efforts to quell the Seediq rebellion. Major characters are dispatched in various ways, including a disturbing sequence in which Seediq women hang themselves so as to not become a burden for the male warriors. Essentially the Taiwanese aborigine version of the Battle of the Alamo (It’s not a spoiler if it’s history! ), the Wushe Incident and its subsequent uprisings guarantee that many of the Seediq characters in the film will be dead by the end. Since Wei has created so many characters striving for significance throughout the story, he feels the need to give each character their own moment when they meet their end. However, the intended impact of those moments is heavily reduced by the repetition of battles and spectacle. Seediq Bale does have universal themes expressed in a genre that has been present since the days of The Battle of Algiers and used as recently as Avatar. The idea of oppressed, exotic people taking a stand against a self-perceived superior, civilized group is the ultimate David vs. Goliath story in a post-colonial world. However, Wei doesn’t take the effort to explicitly explain the acts in the context of Seediq culture (especially the tree hangings), and viewers unfamiliar with Seediq culture may find the amount of decapitations and other seemingly savage acts exploitative and excessively brutal. In fact, those without the proper context may even find the Seediqs unsympathetic and deem the film not emotionally involving enough to invest four hours into. The lack of sympathy might also be caused by Wei's insistence in staying grounded in reality rather than simply telling an audience-pleasing underdog story. Instead of portraying the Japanese (who have become the Asian cinema equivalent of the Nazis) as downright evil, Wei makes an effort to create sympathetic Japanese characters and gives Mouna anti-hero qualities. Mouna's resolve to be a strong leader and uphold his people's pride makes him the most heroic character of the film, but Wei also avoids glorifying his violent nature by showing Mouna's stubborn grudge against a rival clan leader and his disregard for human life in the name of traditions. These flaws make Mouna a more intriguing, multi-layered character, but they can also make him unsympathetic for those who can't accept the Seediq traditions seen in the film. Notes:  In addition to a new 150-international cut different from the one that premiered at Venice (and was critically panned), Wei also cut about 15 minutes of footage (featuring Seediq traditions and parts of the coda) for the Hong Kong theatrical version of part two. This review refers to the full Taiwanese theatrical version.